Newt Gingrich discusses the merits of Donald Trump. A spirited debate with the former speaker on the merits of the mogul. 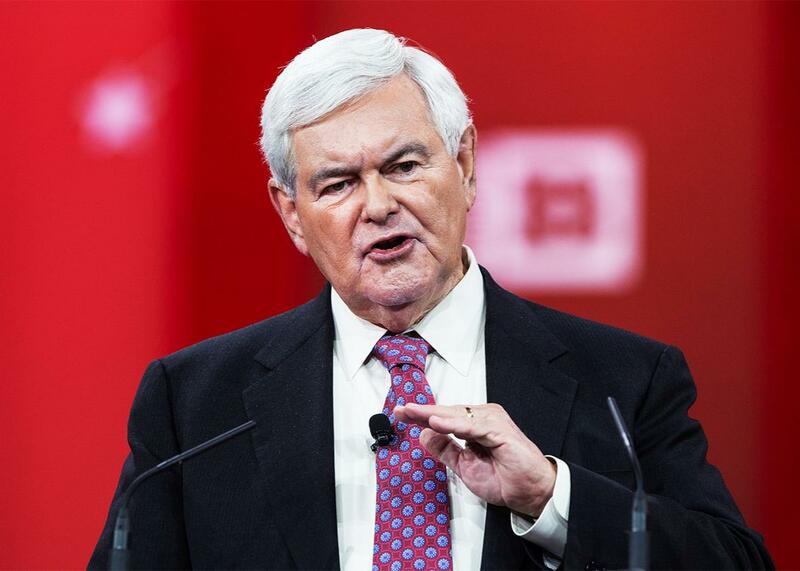 Former House Speaker Newt Gingrich speaks at the 2015 Conservative Political Action Conference in National Harbor, Maryland. Newt Gingrich, the former speaker of the House and onetime presidential candidate, has always been considered a man of ideas. After leading his party to power in Congress following the release of the Contract With America in 1994, Gingrich became known for his sometimes-quirky policy proposals and unabashed love of wonkery. During the 2012 campaign, he pledged to establish a colony on the moon. I called Gingrich on Tuesday afternoon to talk about Trump, the future of the GOP, and bigotry in the Republican Party. The conversation has been very lightly edited and condensed. Isaac Chotiner: You were at a meeting on Monday with other Washington figures and Trump. What did you make of him? Newt Gingrich: Well, Callista and I were both very impressed. In that kind of a setting he talks in a relatively low tone. He is very much somebody who has been good at business. And he listens well. He outlined the campaign as he saw it. I think he did a good job listening. He occasionally asked clarifying questions. He was very open to critical advice. I am not going to get into details, but I will say my overall impression was that in that setting he was totally under control as a guy who has done a ton of business and knows exactly how to operate in that kind of room. You seem more sanguine than other people in Washington about Trump’s rise. Is that fair to say? Sure. Remember, I came in as a Reaganite, Kempite when I helped lead the effort in 1994. And I have consistently been in favor of a more aggressive, more active Republican Party that reaches out and expands its base and that is very, very idea-oriented. I think Washington is a city with enormous problems. I think we need somebody—and both Cruz and Trump fit this—who is going to break up the old order and insist on real change. It’s not that I am sanguine. This will lead to a period of very real challenges, but I think we need it. I don’t think it’s in crisis. It’s in a period of change. It wasn’t in crisis when Reagan ran. The old-timers had as big a problem with Reagan as they are having with Trump. It is the nature of the old order to be scared by something they don’t control and don’t understand. So when Trump releases his list of foreign policy advisers and no one has ever heard of them, that doesn’t bother you? Look, I would recommend, if you haven’t done it, that you read The Art of the Deal. And you follow that up by reading The Art of the Comeback. Are you really telling me to read The Art of the Deal? Yes, I am. I have a very simple rule, which applied to Obama, and Bill Clinton, which is that somebody smart enough to get millions of votes is somebody I should study. I have enough humility to believe that maybe they know things I don’t. Here was a guy on the cover of Time magazine in 1989, who had the No. 1 best-selling business book in the 1980s, had the No. 1 television show. There is a rumor that I cannot verify that NBC was offering him $12 million per episode. He likes to mention that. I know but per episode?! Mr. Speaker, we are talking about a possible president here. You are talking about a guy who was smart enough to build Trump Towers, build lots of hotels, build lots of casinos, and own the Miss Universe contest. He is not stupid. For many people, that seems to be inconceivable because they have a university Ph.D. theory of being smart. Didn’t you write your Ph.D. thesis on the Belgian Congo? I did, and I wrote my master’s thesis on Japanese and Russian railroad construction in the 19th century. So why are you bashing people with Ph.D.s? Because I have been in the real world, doing real things, and I understand the limitations of academic knowledge. I think it’s greatly overrated. No. I read what he said about NATO, and I think it has been grossly taken out of context. What he said about NATO was the Bush–Rumsfeld position, which is that the Europeans ought to pick up more of the slack. What about his thoughts on Putin? [Laughs.] He doesn’t want to get into a fight with Putin. I don’t know that that is stupid. Putin has 5,000 nuclear weapons. You want to try and defend the Obama fecklessness? All bluster and no performance. Look, I am just having a cheerful on-the-record conversation with you, so feel free to fire away, but I feel equally free to fire back. That is totally fine. I like it. Does none of Trump’s rhetoric about Mexicans or Muslims worry you or upset you? There are plenty of conversations to have about vetting refugees, but you are a smart guy, you know exactly what Trump is doing. I heard Trump say at a rally that if you are a Christian living in Syria, Obama won’t let you into America. If you are a Muslim living in Syria, it’s the easiest thing in the world to come to America. And then Trump said, essentially, we all know why Obama acts this way, but I am not going to say it. You and I both know what he is playing to when he says that stuff, and it isn’t our finest impulses as Americans. Well, what do you think he is playing to, other than the fact that it is true? It’s true that it’s the easiest thing in the world for a Muslim in Syria to come to the United States? Well, it is certainly in Obama’s interest to allow you to come as a refugee. He’d let a lot more people come if he could. People are suffering everywhere. How about everybody in Darfur? Should they all come to Miami? The suffering thing is liberal tripe. It is nonsense. That doesn’t sound so much like the Reaganite conservatism you mentioned earlier. Suffering is an excuse and allows people to be guilt-tripped into doing bad policy. Look at who is going to Germany right now. These are population migrations, not refugee streams, and they are going to change Europe permanently to our disadvantage. What we know is that Trump has had the nerve to raise questions in a clear language because he represents the millions of Americans who are sick and tired of being told that they have to be guilt-ridden and keep their mouth shut. So why are Trump’s negatives so high, if he is giving a voice to the masses? Look, Trump has been campaigning in a Republican primary with harsh language and has been routinely attacked by the elite media as much as they can. Reagan went through the same cycle. Do you know how many points Reagan was behind Carter in March? It was double digits, right? Twenty-five. Not just double digits. Twenty-five points. So if you had talked to me in March of 1980, you would have said, “How can I support this crazy right-winger who makes movies with chimpanzees and is 25 points behind Carter?” And I would have said, “Because I think he can win.” Which, by the way, he did. Is there really nothing that worries you about this guy? The way he deals with reporters, his campaign manager, etc.? You are not at all worried he has authoritarian tendencies? No. No. [Laughs.] Which part of that is supposed to bother me? That his campaign manager may have assaulted a reporter? Oh c’mon. Did you ever look at it? I have looked at it, many times. He grabbed her arm very hard. [Sarcastically] He grabbed her arm very hard. OK. He grabbed someone else a few days ago at a rally. It’s on video! Trump has offered to pay legal fees for people who hit protesters. None of this worries you at all? You are asking and I am telling you. And by the way, his strategy with the media is quite simple. In a Republican primary, nothing helps you more than being the guy who stands up to the media. I think I can testify to this from personal experience. Yes, I remember your debate in South Carolina. Yeah. So Trump has carried it to perfection. The media doesn’t like it but the fact that Trump, if you watch some of the things the media does to Trump, the fact that he fights back doesn’t bother me at all. It’s hardly authoritarianism, for Pete’s sake. Unless you want to say that Margaret Thatcher is an authoritarian, and John F. Kennedy, who you will remember at one point kicked out the New York Herald. I didn’t know that. For what? He didn’t like the coverage so he kicked him out of the White House. Well, I don’t approve of that. Of course you don’t. I do. I’m a politician. I thought it was kind of cool. You are the press. We are even. You must know a lot of people in Washington like Kristol and Krauthammer and George Will who are horrified by Trump. This isn’t just liberal angst. I think a number of them need to go on vacation. You think that is all it is? I think the tension is getting to them. Of having to deal with something that they don’t understand and don’t believe in. It horrifies them. It represents an alternative world they never dreamed of. And what is that world? Many years ago, Bill Buckley said that he would rather be governed by the first 100 names in the Boston telephone book than the Harvard faculty. Well, that may be what is about to happen. I think there is no one on the Supreme Court who didn’t graduate from Yale or Harvard. Does that not strike you as a little narrow for a country of 315 million people? You must notice that Trump has no serious foreign or domestic policy, and that these “intellectuals” who are horrified by this are not just dreaming it up out of nowhere. They are queueing off something different than the American people are. Is your job, as a politician, to merely follow the American people? I am applying the Buckley principle to the Washington intellectuals. They are inbred, they talk to each other, they are treating the American people with contempt. Forget Trump. Seventy percent of Republicans between Trump, Carson, and Cruz have repudiated their world. And they are saying, “Boy, these people are really hicks. They are so stupid they have been taken in.” Well maybe, just maybe, those American people know something the guys in Washington don’t, and frankly, I am on the side of the American people, not the Washington intellectuals. I am guessing that I can’t convince you that the Carson campaign was basically a direct-mail scam, in that case. No, the Carson campaign was a very sincere guy who probably wasn’t prepared to run for president and who attracted an amazing number of people. So I think it is a bit much to say that the people who decided to give money to the guy who was tied for first or second in the polls was a scam. He couldn’t put it together, but it tells you something that people gave him $62 million because they found his quiet, calm honesty better than the sick system they are tired of. I would say that’s a more accurate statement. You have one more question, then I am gone. If there is one thing you think the GOP needs to fix, what would it be? To design a campaign to include every single American and every single neighborhood. Something tells me it is going to be hard to do that with someone who speaks negatively about many minority groups. It depends what he says when he goes into those minority groups.